Raye Birk and Peter Michael Goetz in The Sunshine Boys. Photo by Michael Brosilow. Peter Michael Goetz dominates The Sunshine Boys (at the Guthrie, through September 2), Neil Simon‘s paean to the lost glories of Vaudeville. Goetz plays Willie Clark, one half of the famous comedy team Lewis and Clark. It’s the early 70s and Vaudeville is long gone. Clark dodders, wanders his sprawling apartment is a fog of (often deliberate) forgetfulness, rarely changes out of his pajamas, watches his ancient TV, drinks dreadful tea, dozes. And yet Clark remains a spitfire of energy and ambition, auditioning whenever he can, letting loose his keen comic insights: “‘Ks’ are funny,” Clark avers in one of the play’s most famous moments. “Chicken is funny. Roast beef is not funny.” Goetz (with, no doubt, strong counsel from director Gary Gisselman), avoids the temptation to overplay Clark and make him a dismissible goof. At an age when most of us would ease into a well-deserved retirement, Clark still pounds the actor pavement – and gets occasional commercials (jobs he loses when he forgets the name of the product he’s selling). He’s stuck in the 1920s (“What, I can’t play black? When I played black you could understand the woids.”) but he persists, undaunted. Is Clark simply avoiding the imminence of death? Maybe, to a point, but I think he’s truly dedicated. He inspires. Willie is aided in all this by his nephew, Ben, an actors agent who, clearly, loves and respects his frustrating and frazzling uncle. Robert O. Berdahl plays Ben and it is a great pleasure to see this performer give such an affecting performance — a lovely contrast to his over-the-top work in H.M.S. Pinafore. His Willie-induced chest palpitations are genuine, and very funny as a result. When Ben puts his arm around his uncle we see family, real inter-generational connection. Again, kudos to Gisselman. Ben has set up a performance of Lewis and Clark, on a CBS Comedy Special and this brings us to the heart of the play: the reunion. Lewis and Clark worked together for 40+ years. They live in the hearts of their audience. And they despise each other: “We had our ups and downs. In 40 years there was one up.” It is all they can do to get through the Doctor Sketch, a piece they have performed thousands of times. When they attempt it on TV, it results in… Well, see the play. Raye Birk plays Al Lewis. Stiff, formal, dignified and aloof, seemingly contained, he is a delightful foil to the loose-limbed Goetz. Birk lets us see how brilliant these two must have been together. He – almost – convinces us that they really do despise each other. The ever-delightful Greta Oglesby does a small but effective turn at the Willie’s Nurse (“I’d marry you, but I don’t think I could keep up.” The great Dudley Riggs has a tiny but very memorable part. 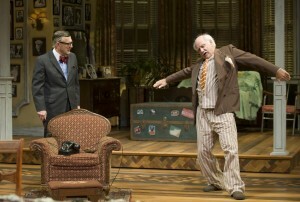 Unfortunately, in my not-so-humble opinion, The Sunshine Boys is not a Simonian highpoint. It’s extremely repetitive (“Uncle Willie, open up, it’s Ben.” “Is that you, Ben?” – ad nauseum). The play is often static and predictable; I found myself wearing a get-on-with-it scowl. And, most serious, I found myself unconvinced by the hostility of the two leads; it seemed a diminishment of the characters. But maybe I’m wrong, and in any event, who cares: The Sunshine Boys provides a grand playground for Birk and Goetz and you are unlikely to encounter better actors anywhere.